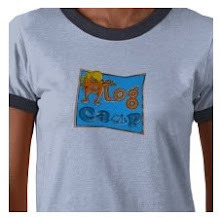 blog campers...please bring a journal with you when you come to blog camp 3.0! we'll get out my stash and we can do a bit of art journaling, since the weather is likely to be rubbish and no fun for playing outside. YES. Always wanted to do art-journaling with others. Now I have the chance to see how others move around with that. LOVE IT!!! I've no idea what I might art journal, but I already have a journal picked out! C and I are going to go to Liberty this week to look for some fabric to bring . . . including some for the hostess, of course.